Discovery services collect and index full-text data and its metadata in one place for your users to search. More detailed information about these partnerships, including information on how to set up your Credo resources, is below. If you have any questions, or are using another Discovery service and would like to see Credo resources in your search results, please submit a support request. Don't see your service listed? Try our Metasearch vendor page instead. We regularly send both our content and our metadata to these vendors. Our customers can simply enable the correct Credo collections in the Discovery Admin account to make Credo entries and (in some cases) Topic Pages discoverable in their institution’s interface. If you're not sure what collection you have, please see this FAQ page. In the Packages list, find the Academic Core collection and set to "Selected under Current Holdings." Customers are able to carry out both of these processes on their own. However, EDS recommends that customers work with their support team at eds@ebsco.com. Set up the CustomLink for your subscribed collection(s). Academic Core should be pre-defined, so you can select it from the list (Step 7 in the how-to doc below). If you can't find your collection on the list, you'll need to set up a local collection (next step). Set up Local Collections for each collection not set up as a predefined CustomLink. When a library administrator sets up a local collection in EBSCOadmin, a file is created that describes the collection and tells EBSCO which titles should be included in it. In the Packages list, find each collection you subscribe to and set to "Selected under Current Holdings." Credo entries and Topic Pages are often classified as “Books,” “Research Starters” or “Electronic Resources” under Source Types. The “Credo Reference Collections” option under Content Provider will display only Credo resources. To determine if a specific search result comes from Credo, look at the result’s detailed record; if search.credoreference.com is in the URL field, you’ll know it’s from us! You can find the process to set this up in the EBSCO Knowledgebase, or we can initiate set-up upon request. Credo search results can also be set up to appear in a placard at the top of your EDS search results, in place of the built-in EDS "Research Starters" placard. To see what it looks like, click here. In EDS admin, navigate to Viewing Results > Widgets > Custom Widget. Use "Custom HTML" (as opposed to "IFrame HTML"). Set "height" to 1 and use the following code in the Custom HTML Box. You'll need to add your Credo client ID (available from support@credoreference.com) where the code reads CLIENTIDHERE. All Credo URLs support the use of the institutionId parameter, which uses a unique ID number for your account to facilitate remote authentication. Any link that includes this parameter will redirect remote users to a log-in page specific to your account and prompt them to log in via your preferred remote authentication method (e.g. proxy, username/password, library card). After authentication, the user will land directly on the page they were trying to access. In addition, if your account shares a proxy server or IP ranges with any other accounts, using the institutionId parameter will ensure that your users reach the correct account. In particular, we recommend this option if you do not use a proxy for access or if you share a proxy server with other institutions, since it will help students log in to the correct account. For more information, including instructions on finding your institutionId, see here. 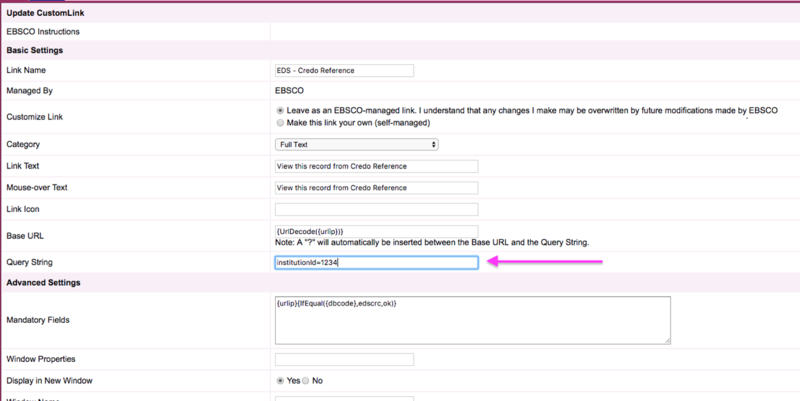 The institutionId parameter can be added to Credo entry links in your EDS by updating your settings in EDS Admin. If you prefer, you can ask the EDS support team to assist you by emailing support@ebsco.com. The institutionId can be entered in the ‘Query String’ field in the CustomLink for your Credo collection, as shown here. Please note that the ‘?’ before ‘institutionId=’ will be automatically added between the Base URL and the Query String. "Credo Academic" will enable Academic Core titles only. Please note that this does not include the "Backfile" titles of Academic Core with Backfile. "Reference Materials" will activate all Credo titles, including ones to which your library doesn't have access. This may be a good option for customers who don't subscribe to Academic Core. "Credo Reference Topic Pages" will integrate Credo's 10,000 research-starting Topic Page articles. These pages are accessible in any account. Credo entries and Topic Pages are often classified as “Reference Entries” under Resource Type. 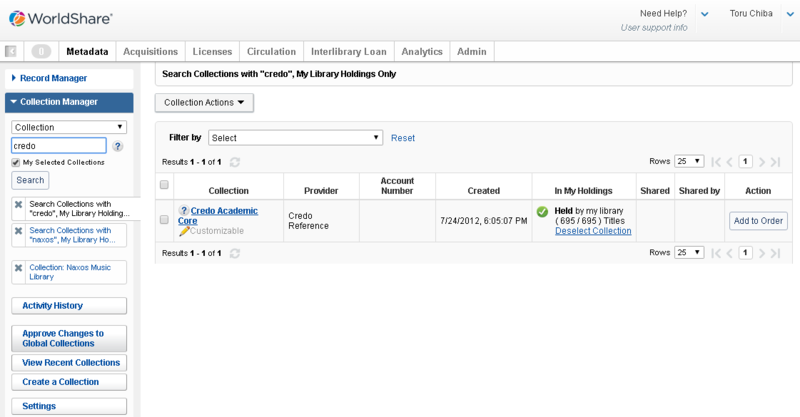 The “Credo Reference” option under Collections in the Refine My Results menu will display only Credo resources. Credo can be integrated into the Enterprise Discovery System using our z39.50 Gateway. You can use an existing Credo username and password to set up this access, or submit a support request to have us create a new username and password. The Record Character set should also be MARC8 rather than UNICODE. For more help with the set-up, Sirsi customers can contact Sirsi customer support. Credo entries are available in Summon search results. Choose your Core Collection (Academic Core, Public Core, Student Core, Complete Core) in the Summon Client Center. Don't choose "Credo Reference All Titles" or "Credo General Reference", as these do not match customer-facing collections. We also have a "Featured Encyclopedia" integration of our Topic Pages. If you enable this, a Credo Topic Page will appear at the top of your Summon search results where there is a page that matches your search term. If there is not a matching page, another of your reference resources will appear (such as Britannica, GVRL, or Worldbook). To see Credo entries in Summon search results, “Reference” needs to be included as a Content Type. You can set this as a default for your search results in Summon, and users can also select this option individually. All Credo resources will say “Reference: Available Online” underneath the result summary in the search results list. In WorldShare, go to Collection Manager > Setting > WorldCat Holdings" and click "Maintain Holdings: Yes"
Once you've enabled Credo titles, your own content should appear near the top of search results, followed by some content to which you do not have access. You should also have the option to limit to just what's in your library's subscription after the search. To link to entries, rather than just titles, you must enable 856 linking. To do so, go to My Worldcat.org > Full Text and Open Access Links, and check "Links from the Master WorldCat record 856 to Non-open access content/free content." Click here for a PDF with screenshots of this process. To add the institutionId to Credo links in OCLC Discovery, follow these steps. If you prefer, you can contact OCLC Support for assistance at support@oclc.org. 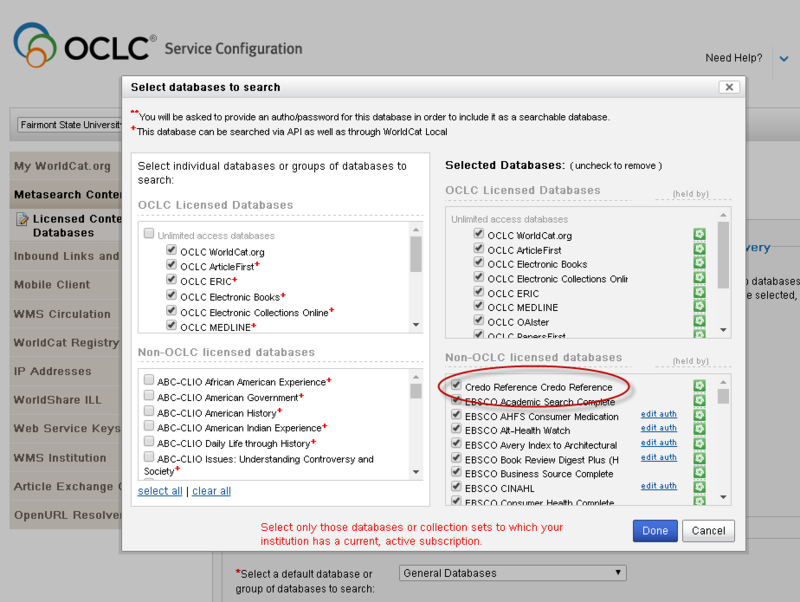 In OCLC Knowledgebase, navigate to the settings for your Credo collection and look under the “Linking" header for the "Title Link Formula" field. Make sure to replace the **** with your institution Id number.